Boost your storage with a top-end SSD from Amazon UK. Looking to boost your PC’s capacity this holiday season? One of our favourite SSDs is on sale right now at Amazon UK at almost half price. The Samsung 860 Evo 500GB SSD features very highly on our list of best SSDs for gaming, and is an absolute steal at £71.45, down from an RRP of £137.77. Amazon has a multitude of capacities on offer in the 860 Evo range, with a whipper snapper 250GB size all the way through the terabytes to a gargantuan 4TB model that should sate even the largest of media and file collections. 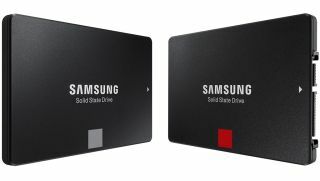 The Samsung SSDs are always fighting it out with other manufacturers to be the best SSD for games and this model is no different. It’ll be perfect for housing all your extra games, save files, media and TV and movie downloads and, being a Samsung, will be a reliable and solid performer. If you’re after even more storage the larger models (up to that massive 4TB) are worth a look as they too are on offer.